I found this Kindle book on sale in Amazon today. I was attracted by the title and I so love the cover design. It's print list price is $15.99 and it's Kindle price is only $2.99. I got a copy and started on it. I like it. I have just read the introduction so far and I think it's going to be a good read. Here are some excerpts. ...the brokenness of lifelong disability leaves many people in a state of what some have called “chronic sorrow.” And too often, the Christian church in the West communicates to people that sorrow and brokenness are conditions we expect people to overcome and conquer...But the hard truth is some of us, by God’s difficult providence, find ourselves facing brokenness day in and day out with no prospect of a significant change in the situation. In fact, though you walk on with Christ, by faith, often with gritty devotion and hard work, not only does the situation not get better or go away, but too often it gets more and more difficult with every passing year. Why do we in the evangelical church in the West demand that everyone be “normal” and look the same? Why do we as a culture try so hard (and succeed so well!) at hiding people with disabilities from our everyday view? Why do people with visible and invisible brokenness often feel as though they have to hide the problem in order to join God’s people for worship?...and perhaps most importantly, what answers does the good news of the gospel give us for these questions, and how does the gospel give us hope in these situations? But even a casual survey of most American congregations shows that these weaker, indispensable, and especially honorable members are, for the most part, simply not there. Or, if they are present, too often they are either separate from others (and I realize that this may be necessary in some cases) or they hide their brokenness behind masks of false happiness and superficial normality...We have been to churches where we have had to carry Jessica’s wheelchair over obstacles or up steps to get inside. We have experienced the quiet stares that betray an unspoken discomfort with our presence...the more vital problem is that the Christian community generally tends to keep people with disabilities marginalized in the church. We must set out to destroy some dangerously outmoded concepts about people with disabilities and how they must be treated...once we have this base of Bible and history upon which to build, we can develop principles and outline a gospel paradigm that will help believers individually and churches corporately first to embrace their own brokenness and then equip them to embrace those more physically and visibly broken around them. 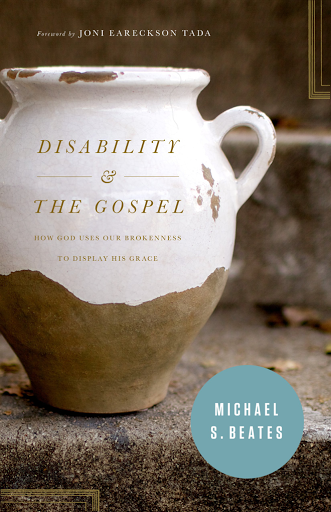 I have got lots to read and especially these two books with just the last sections to finish up but I can't wait to dig into this one and learn about the theology of disability and brokenness. Look forward to reading your review of it Pearlie. Will do. It isn't a thick book. Will finish it quite soon.